A few years ago, I did a round robin project with a group of internet-friends. 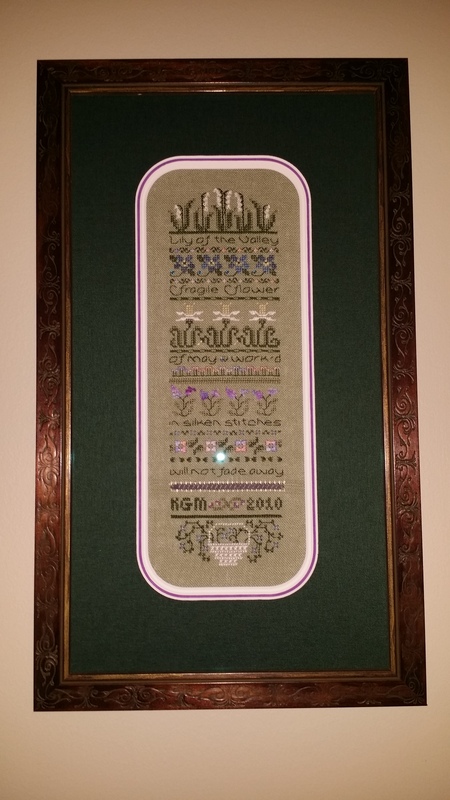 This was the piece that I selected for the round robin, a kit entitled Lily of the Valley by The Drawn Thread. There are a few different drawn thread techniques in this one, but nothing too daunting. I love the silk threads in it. The round robin ended in 2010, but unfortunately the green silk fiber ran out before this was completed. I wrote to The Drawn Thread, and they happily sent me more. But by then I was preparing to move and all of my needlework ended up packed away for the next 3 years. I pulled everything out this spring, and I finished this piece. I’m so happy that I finally did. It hangs in our kitchen and cheers me every day. Mom of two. Wife. IT Manager by day. Crafty mom when I can find some free time.